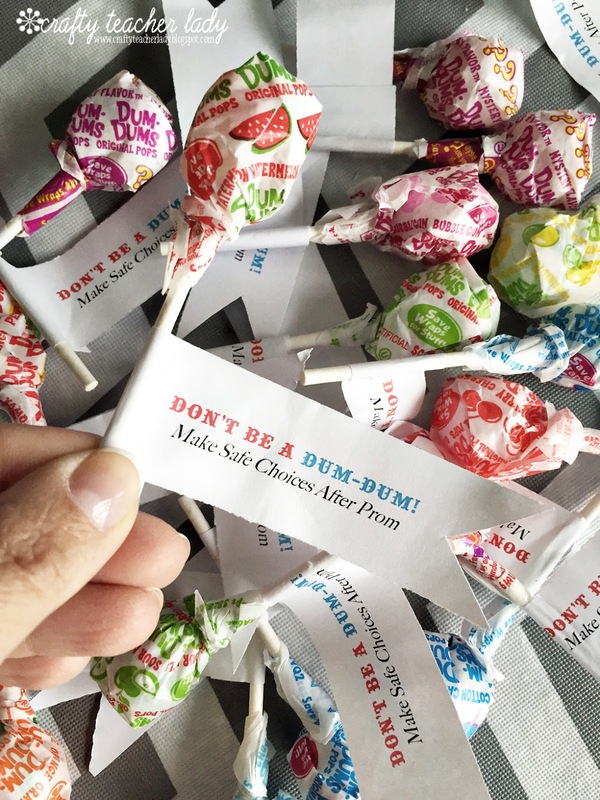 It's May and that means PROM time! 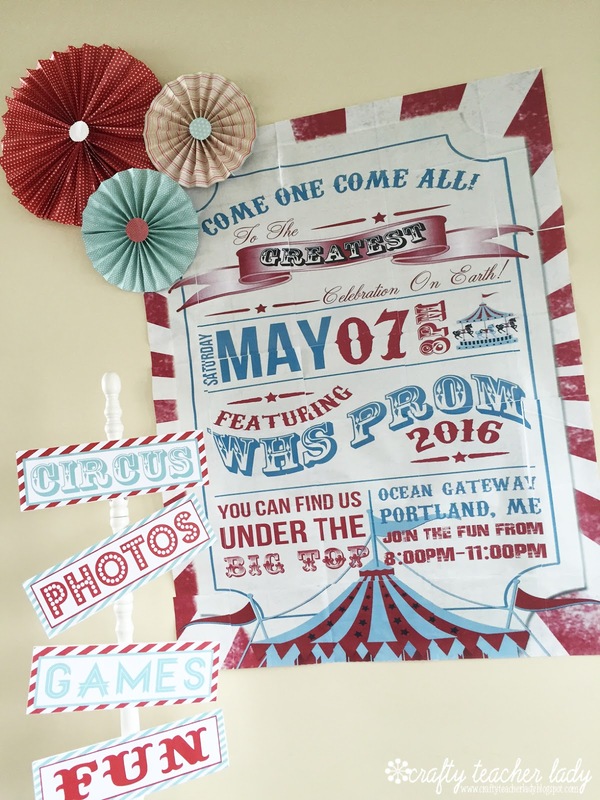 I'm advisor for the Class of 2017 and it was our turn to plan this year's prom. I've been thinking about this event for over a year and even started a Pinterest board to gather lots of ideas. 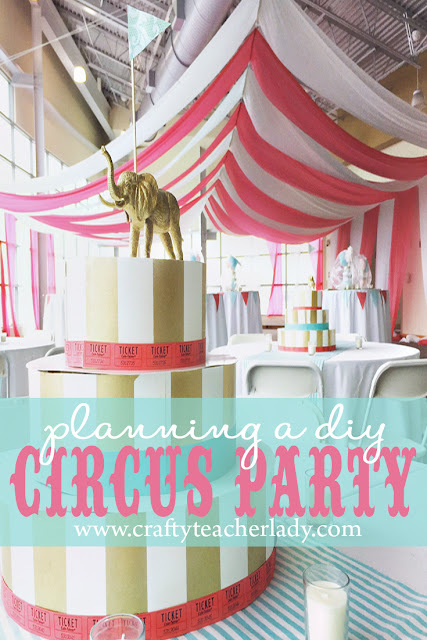 We decided on a circus/carnival theme and had lots of fun crafting and getting creative with a tight budget! 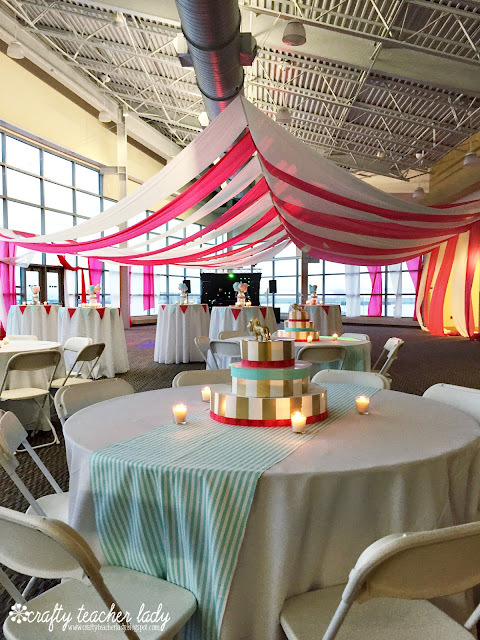 Below are some ideas and resources to create your own 'Night Under the Big Top' event! 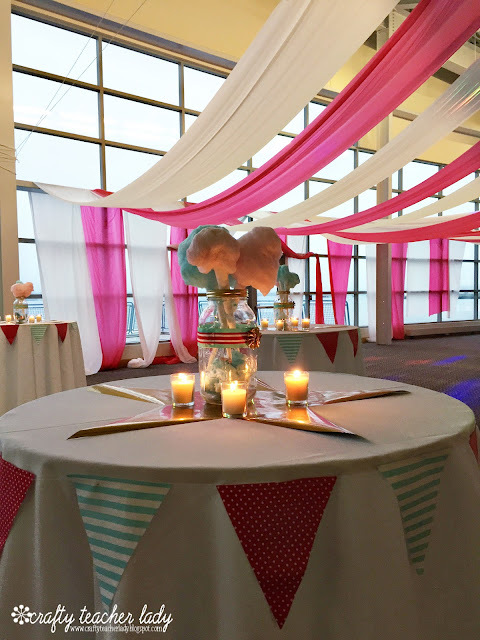 We hold our prom each year in a spacious waterfront venue with gorgeous views. The room has sloped cathedral ceilings and is pretty much a blank canvas, which can be a bit overwhelming to try and fill. My initial thought was to try and create a circus tent of sorts on one end of the room under which would be the DJ and dance floor. After doing some research to find something affordable, I purchased several red and white plastic tablecloth rolls from Oriental Trading Company. These long rolls of tablecloth, along with some rope and duct tape, became the basis of our tent! It really defined the space and added that 'wow' factor as kids walked into the room! They had a blast dancing under the big top! Thinking about our limited budget, we got creative and crafty with our centerpieces. 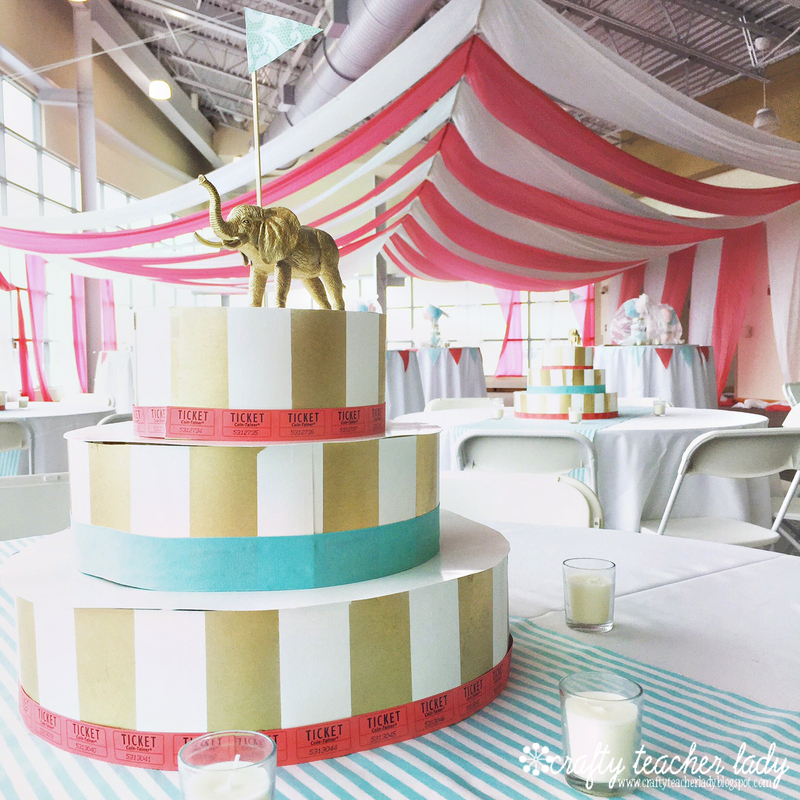 For the larger tables, we purchased some striped fabric from WalMart to drape over our rented white linens. We looked all over for affordable 'cake dummies' as they are called to create tiered centerpieces, but they were all far to expensive. So, one day over February vacation I played around with some poster board sheets and was able to create my own by cutting long strips for the sides and using some kitchen mixing bowls to trace three different sized circles for the tops! The circles were taped to the strips with clear packing tape (but any tape will work) with a little overlapping to help stabilize each layer. 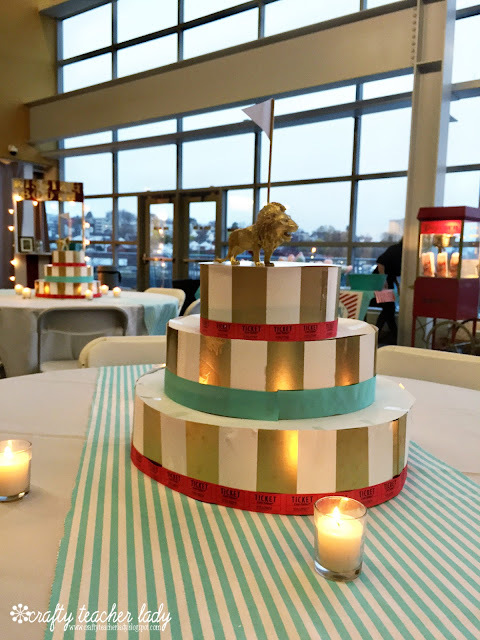 The prom committee students decorated the cakes by using gold spray paint and painters tape to add stripes to the poster board. 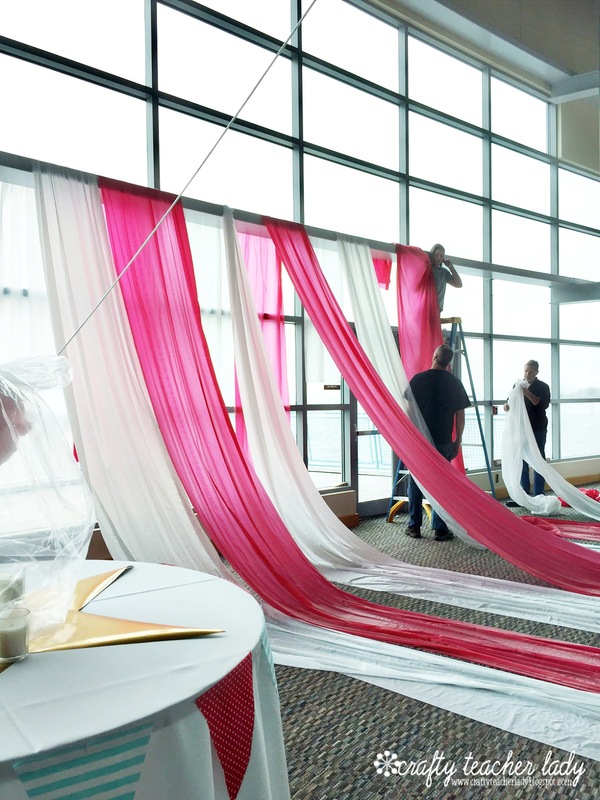 Then they glued on strips of tickets and ribbon to add some color. 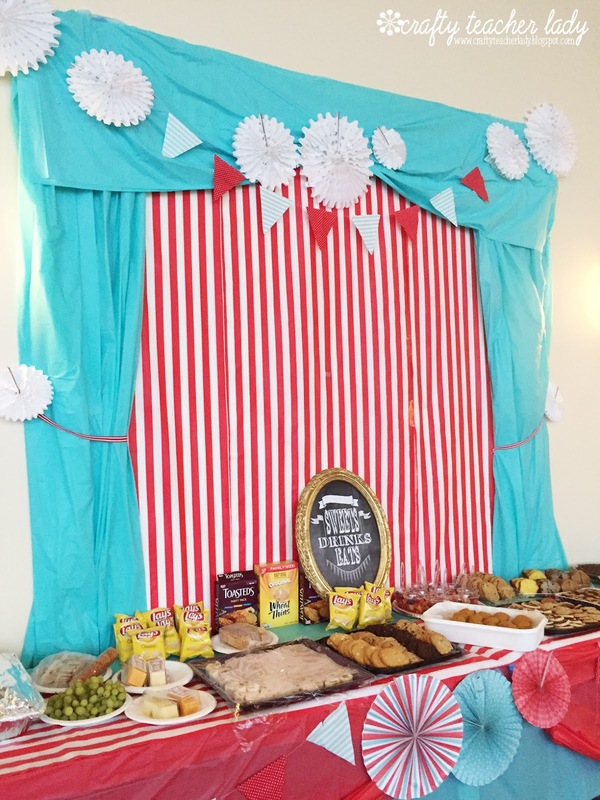 We used wooden skewers and scrapbook paper to create the flags for the cake tops. I found lion and elephant toys at WalMart for $1 each and spray painted them gold for a playful nod to our circus theme! 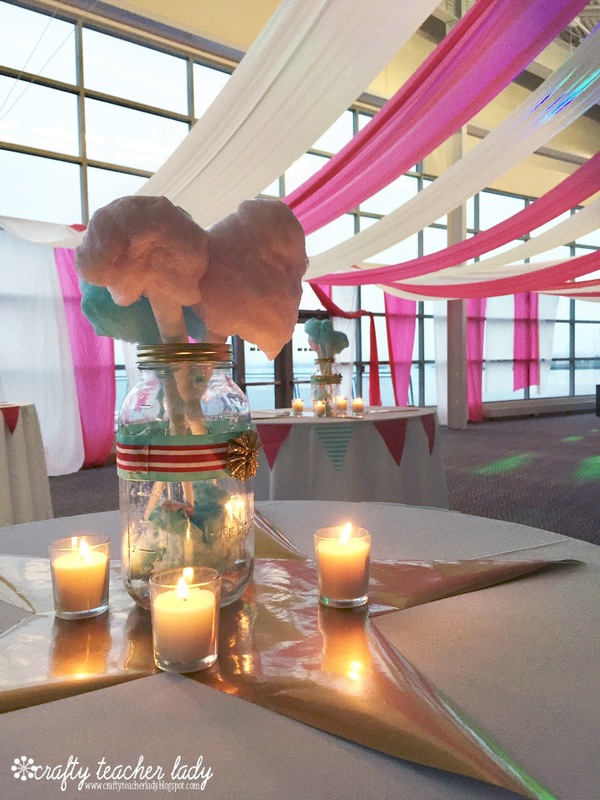 For the smaller tables, we decorated large mason jars with ribbon and paper rosettes then added cotton candy bouquets (we rented a cotton candy machine and a popcorn machine and had a table with food, too). Large gold stars were cut out of wrapping paper and fabric pennants were made by cutting out several triangles then sewing them together with a simple straight stitch! We used sewing pins to secure the flag banners to the table cloths. The candles were purchased in bulk from Amazon. In addition to the cotton candy & popcorn tables, we rented a photo booth, had a caricature artist, and built a kissing booth, mostly just for fun pictures and to add to our carnival theme (no making out allowed...ha ha)! 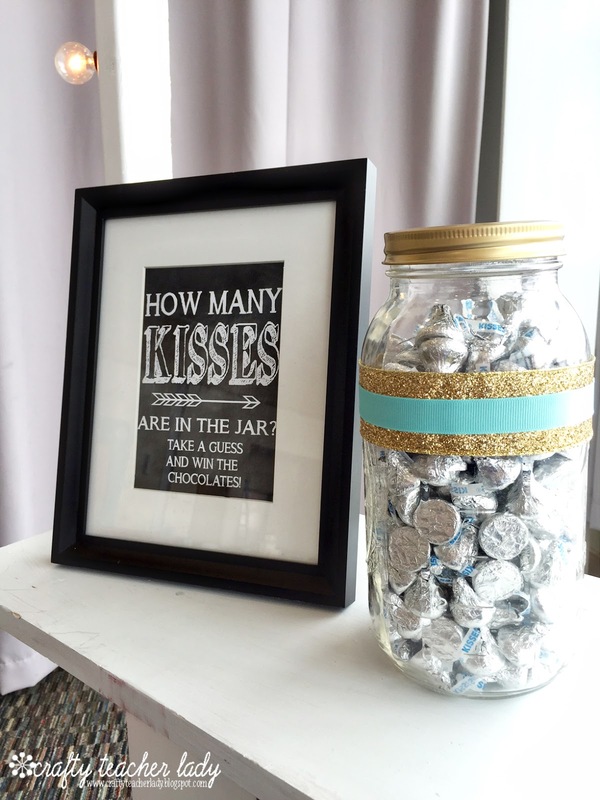 We filled a large jar with Hersey's kisses and had attendees guess how many chocolates were in the jar...the winning guess took home the jar! We also built a large ticket booth for the entryway into the event. Both booths were built out of inexpensive wood paneling and 2x3 boards from Home Depot (I actually found the wood paneling 75% off in the 'damaged' section). 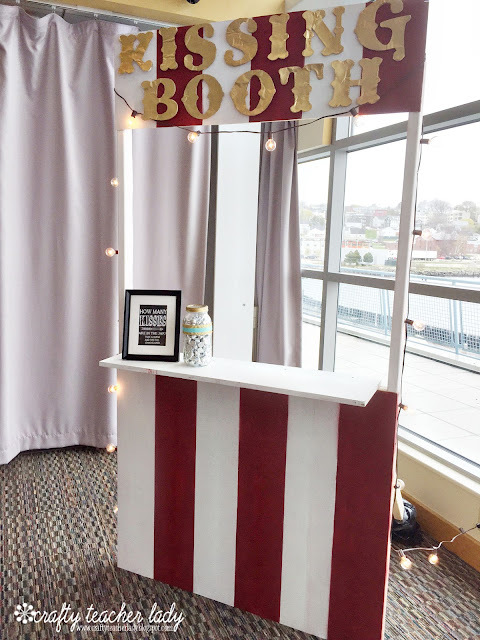 We used red and white spray paint to fancy up the booths! To create the lettering for both the booths, we used our projector at school to trace the letters onto foam board from the Dollar Store and cut out them out with an Exacto knife. Then the letters were spray painted and stuck to the booths using Velco (Command strips or duct tape would work, too)! Our kids eat dinner before they come to prom, however, we did have a table with some finger foods and drinks. 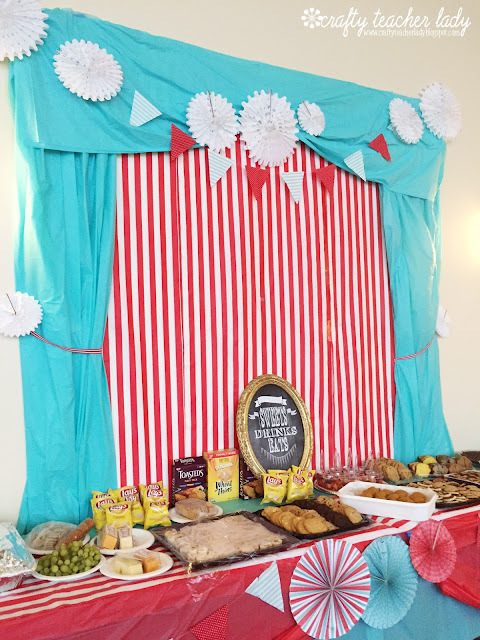 We created a fun vignette using several plastic table cloths ($1 each at WalMart), some more fabric pennant banners (I sewed these at home), and some paper fans. The red striped tablecloth and the paper fans shown here were all purchased from Oriental Trading Company. We used Command strips and painters tape to secure everything in place without damaging the walls. The paper rosettes in the image below were actually handmade using a combination of scrapbook and wrapping papers. Here are some tutorials to make your own if you don't want to buy them! Instead of paying to have tickets to the event printed, I actually found an inexpensive digital design via Etsy and printed out the tickets onto card stock at school. The Etsy shop owner was really easy to work with and customized the design for our event. We used the same design and turned it into a giant poster to put on the wall at the event using an Adobe program which takes the design and prints it out onto several pieces of regular sized printer paper. Then you cut and glue each piece of paper together like a puzzle to create a giant poster. You can also use this free site to create posters using the same process. I designed the small 'circus' signs in Photoshop then printed them on 11x17 regular printer paper (two signs per sheet). The students glued the paper to foam board to make them sturdy then we taped them to a wooden coat rack I keep in my classroom (the spokes to hang coats can be unscrewed leaving just the stand). You could probably design your own signs using Powerpoint since that program allows you to layer images on top of one another. I used free digital scrapbook papers for the patterned backdrops found on Pinterest. No prom would be complete without a little treat and reminder for the students to take with them as they leave! These were designed in Word and glued to Dum-Dums lollipops! The kids got a kick out of it anda little reminder to make safe choices! These could easily be made with any variety of sayings to correspond with your own event and make fun favors for party guests! (For more daily pics of my crazy teacher life, find me on Instagram)! 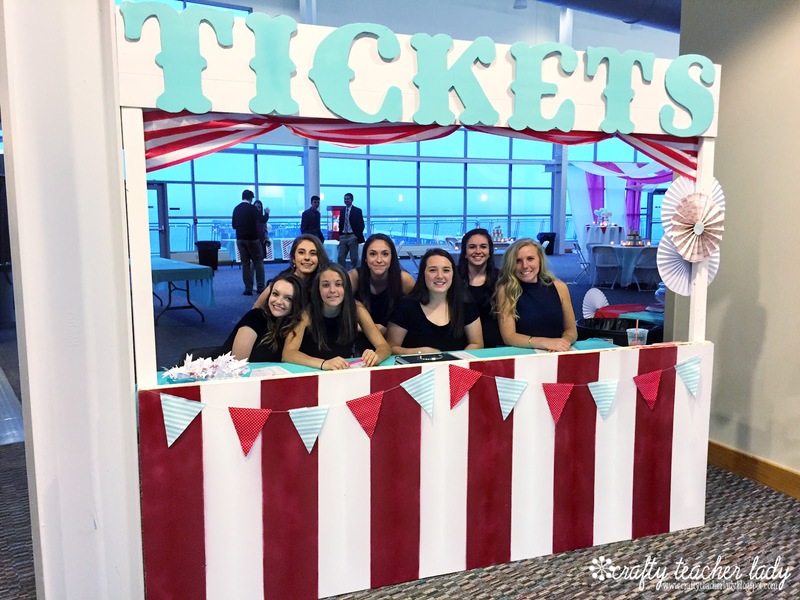 Organizing an event like this for 450 students was no easy task while also juggling my normal teacher work load, but having students come up to me during and after prom to tell me 'thank you' and that this was 'the best prom EVER' certainly made all the hours spent planning and creating and emailing and decorating and cleaning up TOTALLY worth it! Soooo cute & unique!! I love it. 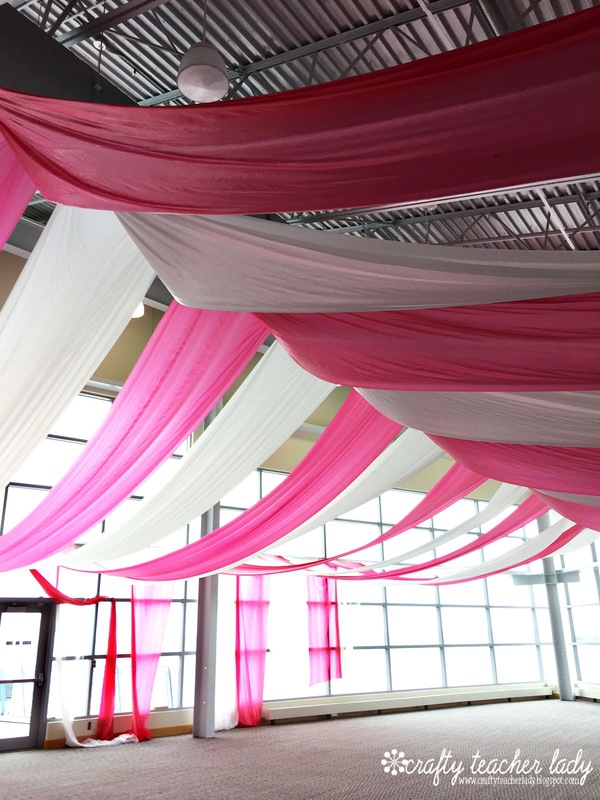 One question...what did you hang the tablecloths from at the "peak" of the tent? Was there a rod already up there or did you have to put something up? Hi Kim! One of my fellow teacher friends created a rope and pully system by attaching the tablecloths to the rope with duct tape and throwing the rope over the exposed rafters on the ceiling. 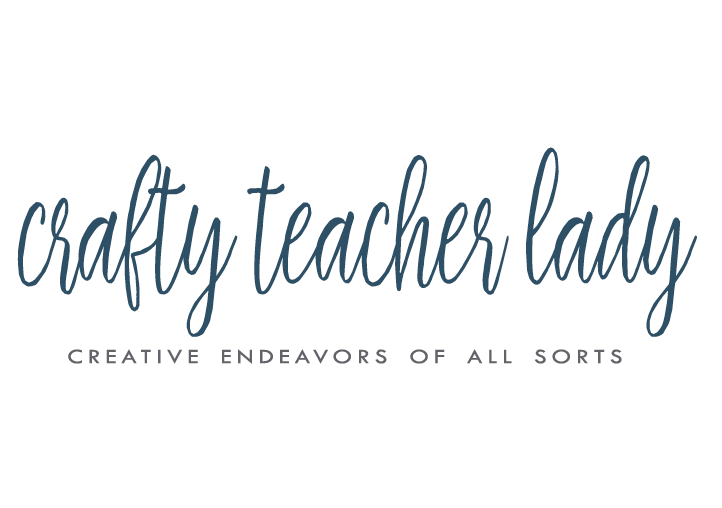 Thank goodness for creative friends who can think outside the box! Wonderful ideas for hosting DIY circus themed parties! I am in love with these ideas. Going to use this idea for my son’s 10th birthday party and quite sure everyone will like it. Looking for suitable lofty spaces to book within our budget.